(Nanowerk News) Gravity remains the dominant force on large astronomical scales, but when it comes to stars in young star clusters the dynamics in these crowded environments cannot be simply explained by the pull of gravity. 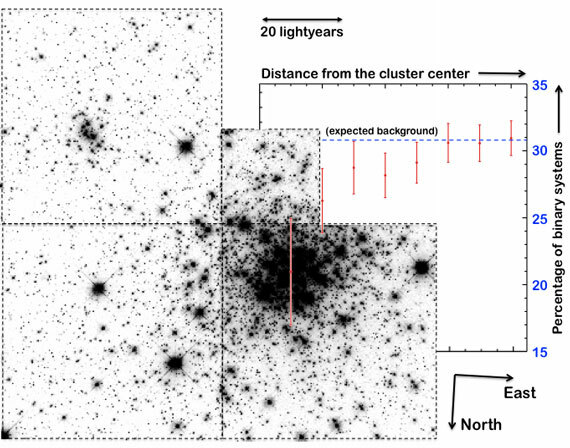 After analyzing Hubble Space Telescope images of star cluster NGC 1818 in the Large Magellanic Cloud, a satellite galaxy of the Milky Way, researchers at the Kavli Institute for Astronomy and Astrophysics (KIAA) at Peking University in Beijing found more binary star systems toward the periphery of cluster than in the center – the opposite of what they expected. The surprising distribution of binaries is thought to result from complex interactions among stars within young clusters. The team’s finding will be published in the March 1 print issue of The Astrophysical Journal and is now online ("Gravitational conundrum? Dynamical mass segregation versus disruption of binary stars in dense stellar systems ").